Using science as an example, we have outlined below how the topic of understanding living things is introduced in the Early Learning Program (PreK–K) and then re-introduced throughout the Primary Program (grades 1–4) in contexts that are increasingly challenging. In Kindergarten, students learn about the basic structures of organisms and their life cycles, naming body parts, exploring the five senses, and distinguishing living from non-living things. In grade 1, students develop a broader understanding as they sort and classify living and non-living things based on whether or not they have basic needs, produce offspring, respond to stimuli, and have cells. By grades 3 and 4, this understanding is applied during explorations of ecosystems and food chains, the relationships of organisms to their habitats, and the specific functions of the body systems. By structuring the science curriculum in this way, our students’ fundamental skills are strengthened over time because they are given the opportunity to deepen their knowledge at each point of exposure to the topic. The success of our spiraling curriculum is supported greatly by our two-teacher model as well. The Subject Expert Teachers (SETs) for every core class consistently collaborate with the Learning Expert Teachers (LETs) to make sure the curriculum is aligned and create an inter-connected learning experience for each student. 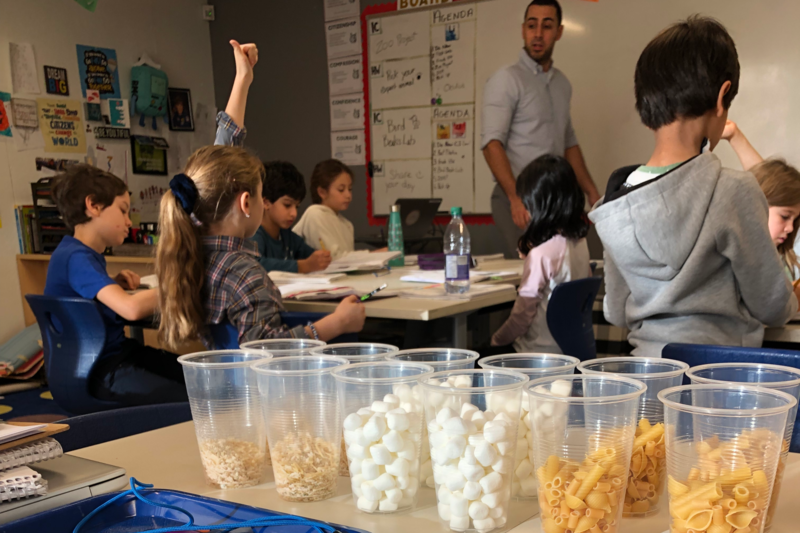 In addition to these science topics recurring at a deeper, more meaningful level year after year, many are also directly associated with math concepts that are concurrently taught (sometimes in the same lesson or day!). This inter-disciplinary approach maximizes comprehension, retention, and the ability to apply their understanding. There are dozens of specific learning objectives each year that are woven throughout the science curriculum as students move from PreK discovery to the advanced AP® courses in high school. We see this learning really flourish when our science sequence allows for three distinct courses (biology, chemistry, and physics) in grades 6–8. As Bruner theorized, our middle school students demonstrate they can exceed expectations and comprehend very advanced material because they have such a solid foundation laid during the Primary Years. Attend an upcoming Information Session to learn about our program!